Properly installed septic systems can still be vulnerable to the invasive root systems of fast growing tree species. Even though most septic systems are made of thick concrete built to withstand their environment the root systems of certain trees will still seek out the nearest water source and will invade your septic system through crack in pipes and any other openings. This has the potential to cause significant damage. Perhaps the biggest danger associated with having septic treat system sprinklers located close to large trees is the ground typically becomes sodden / saturated. With sodden ground and even a moderate wind event, even the healthiest and well structured trees will become uprooted. See below photo of a large Ironbark in Samford the succumbed to the above circumstances which is a real shame as it was a beautiful tree. 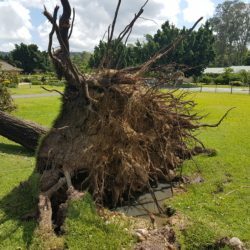 This is one of approximately 15 large trees that North Brisbane Trees has seen become uprooted due solely to septic system sprinklers. If you insist on watering your trees with septic system water, then please be sure to move the sprinklers regularly. When considering planting natives, you should plant them at least 15m away from the edge of septic system drain field to avoid the risk of potential damage to your system from invasive roots. The nutrient rich soil in the area will naturally draw the roots out and they have the potential to clog lines and/or crack lines. Some varieties you should avoid planting are species such as Eucalyptus, Poinciana, Pines, Bamboo, Pepper Trees and any variety that is known to seek out water. If you do want to plant something you should consider varieties of shrubs and ground covers that have a shallow root system and are more drought tolerant (less likely to send root systems out seeking water) but it is still better to stay at least 3m away from the edge of your drainage field even with these types of plants. Talk to the Tree Experts today. 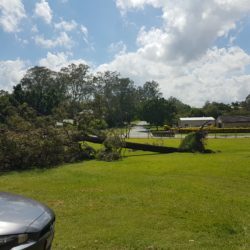 If you are concerned about any potential issues relating to your home septic system, call the North Brisbane Trees office on 07 3289 3610 and arrange to have one of our experienced and qualified Consulting Arborists attend your property.